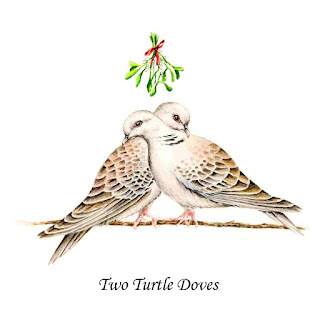 ....my true love gave to me, two turtle doves and a partridge in a pear tree! On Saturday, I shared that the 12 Days of Christmas might actually have been written as a code to those of the Catholic faith, who were not allowed to worship publicly. According to legend, the "two turtle doves" are not actually birds, but represent the Old and New Testament of the Bible. It has been interesting to read about this particular carol and I hope you don't mind me sharing it with you! Thank you all so much for your thoughts and concerns for us during this last round of bad weather. Please keep the families of those that were killed in your prayers. The weather has been horrible down here in the south with so many tornadoes and we spent most of Christmas Day watching the weather channel and listening to the sirens blasting through our area. Cell phone reception and internet service are currently spotty and I hope to be able to continue to post this little series, but we have more bad weather coming in on Monday. I hope you all had a wonderful Christmas full of blessings, peace and joy! Happy 3rd Day of Christmas! Thank you so much! I hate crazy weather like this. Normally, it only happens in the spring and fall, but once every blue moon it happens over Christmas. I feel so bad for everyone who lost their homes and family members! God Bless you and your neighbors. You all are in our prayers. Thank you so much! All prayers are appreciated so much! Thank you so much! We have been watching also for family and friends in Texas and throughout the South! We are praying for all of those families also...it is so heartbreaking! Glad you are okay also! Love and hugs sweet friend!! Glad you are all okay...I talked to my daughter in McKinney and she said they had lots of rain but no tornadoes. Thank you so much Donna! We talked to the hubster’s brother who lives in McKinney also and got the same report. We are waiting to hear from some other friends and hoping they are okay also! Hugs! Thinking of you, Benita! Stay safe! This is very interesting about The Twelve Days of Christmas. I had no idea! Glad you and your family are safe and sound! Oh Benita so scary. Glad you are ok. This weather is too crazy. We are getting freezing rain and some snow today. Roads are horrible here. Stay home and safe and hoping that the storms will settle down for all of you in the south. So scary. Thank you so much Kris! I hate this weather anytime, but especially at the holidays! I would love to have the sleet/snow. You stay safe also...tucked inside with some hot chocolate and a good book! Hugs sweet friend! Thank you so much! I had no idea either and was glad that I ran across the information so that I could share it! Thank you again! Hugs! I'm finding this series very interesting, Benita! I had no idea about the songs origin. Thank you so much! I’m glad you are safe also! The weather across the lower region of the US has been so bizarre! The hubster’s brother still lives in Texas and we have our home office out in Dallas, so all the guys have been keeping us updated. We are still waiting to hear from a few other friends! Hope your day has been restful! Hugs! Sending prayers. My aunt and uncle are / were in the path of the storm in Texas. A friend lost their son. We also had spotty internet and are in for a SNOW storm. Oh Carla, I'm so very sorry...that is just heartbreaking! We are safe and sound and hopefully, the storms are gone for now. Our family and friends in Texas are safe also. I'm so ready for the cold weather and winter! Keep me posted on how you guys are doing with the snow storm...that is frightening also because of power lines and outages! Love and hugs to you sweet friend! a taste of our tornado season... and it isn't even spring! we didn't have tornadoes... but an ice storm instead. just hunkering down and waiting it out. so far still have power! i'm glad you've been safe. my immediate thoughts were of you and dewena. why do i always notice the typo after i publish it? :) YOU'RE. somewhere inside me i must rebel at the apostrophe. wouldn't it all be simpler without that thing? LOL. I hate when tornadoes make appearances out of season...of course, I don't like them in season either, but at the holidays always makes their appearance worse. I'm so sorry about the ice storm and am glad you are tucked in at home safe and sound! I always do that and it makes me crazy...LOL Love and hugs to you dear friend!! I was hoping for a white Christmas but it didn’t happen here either…crazy weather for sure! Glad you are enjoying it and thank you so much! Hugs! !